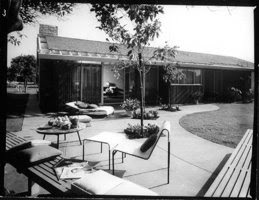 Julius Shulman will be making a public appearance at the museum May 9 @ 2pm. He just turned 98 so it's pretty cool he can make it out. met up with richard smith, fullerton museum curator and walked through museum to see how the new Shulman galley exhibit is coming today. I noticed they have already included various modern items such as Eichler books, starburst lamp and other mid century modern pieces in museum gift shop.